The Crape Myrtle Tonto (Lagerstroemia 'Tonto') is an upright shrub that blooms bright magenta flowers and functions as an accent plant. A hybrid creation from the Japanese Crape and the common Crape, the Tonto can also create small hedges and be used for other screening purposes. A few facts about this mildew-resisting shrub and its beauty: ' In the fall, the Tonto's foliage turns a dull red color. ' Its spring leaves are bronze. ' A less significant, second bloom may likely occur in early autumn. ' And it's likely the last tree in your backyard to lose its leaves. 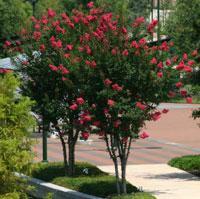 The Crape Myrtle Tonto should be planted in well-drained soil and hardiness zones 7-10. Full sun is required, but, once the plant is established, it becomes tolerant to drought. At maturity, the Tonto will grow a maximum 10 feet tall and six feet wide, making the plant a perfect solution for landscapes with little space.